ANN ARBOR, Mich. (AP) — No. 4 Michigan has the nation’s top-ranked defense with NFL-caliber players at each position group and one of the game’s best coordinators calling the shots. Ohio State’s defense, meanwhile, has uncharacteristically had a hard time stopping a lot of teams. The Buckeyes gave up a total of 100 points in a one-point, overtime win at Maryland and in a lopsided loss a month ago at Purdue. Losing standout Nick Bosa didn’t help, but Ohio State has not found any consistent way to shut down teams. Ohio State has won six straight in the rivalry, but in three wins against coach Jim Harbaugh has not had to defend a dual-threat quarterback anything like Shea Patterson , who is surrounded by talented skill players and a solid offensive line. Michigan may be without defensive end Chase Winovich because of a shoulder injury. If the defensive player of the year candidate can’t play, the Wolverines have so much depth they may be able to overcome it just as they did when defensive tackle Rashan Gary missed three games last month with a shoulder injury. Assistant coach Greg Mattison said before the season started eight or nine players would merit playing time on the defensive line, and he wasn’t exaggerating. The backups do their part, too: Despite being a reserve in every game, Josh Uche leads Michigan with seven sacks. 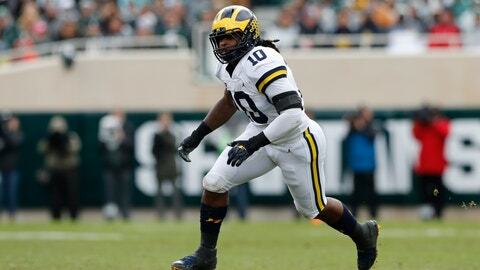 The deep and talented front occupies offensive linemen, allowing linebackers such as Devin Bush to blitz quarterbacks or sprint sideline to sideline to make tackles. Speedy and aggressive defensive backs are put in man-to-man coverage by defensive coordinator Don Brown, a candidate for the Broyles Award as college football’s top assistant. It all adds up to help Michigan lead the nation in yards allowed per game (234.8) and yards passing (123.2) while ranking fourth in points allowed (13.5). Ohio State’s defense took a hit it hasn’t recovered from when Bosa needed surgery for a core muscle injury after playing in three games this season. The defensive end decided to withdraw from school to focus on preparing for the NFL draft as a possible No. 1 pick. The Buckeyes, who usually have stout defenses under coach Urban Meyer, have often looked lost when opponents have the ball. Players have been out of position at times and when they are in the right spots, mental errors and poor tackling have hurt. “Our biggest issue this year is that we’ve been in the right positions, we just don’t make the tackles,” Jones said. The problems were obvious for all to see when Buckeyes missed 20 tackles and allowed Purdue to gain 378 yards in a stunning 49-20 blowout. They’re coming off another poor performance, giving up 536 yards and 51 points to the Terrapins, who had freshman running back Anthony McFarland run for 298 yards and two touchdowns.